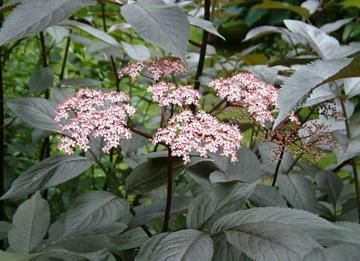 Fairly recent cultivar with excellent very dark purple, almost black, foliage. Retains its colour well throughout the season . Pink flowers with a lemony fragrance followed by black elderberries. Produced by Horticulture Research International of East Malling, Kent, England. Introduced in 1999.